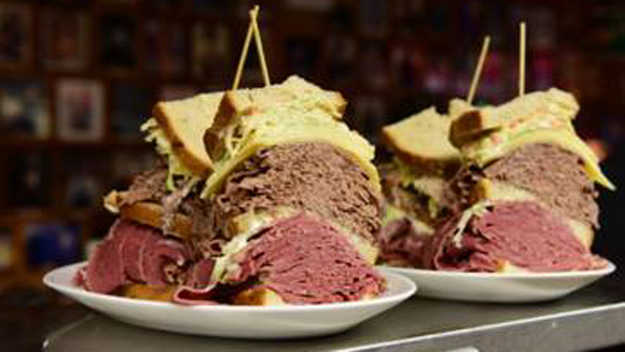 One of my favourite memories of visiting New York back in 2002 is stumbling across Carnegie Deli (on 7th ave). As I walked in the front door the first thing I noticed was every wall jam-packed with photos of celebrities who’ve eaten there. Before I’d ever been there, if you’d asked me to close my eyes and imagine the quintessential NY deli – I would have imagined Carnegie’s. And the “jewel in the crown” as far as I was concerned is their famous sandwiches. The sandwich I picked out had three main ingredients. Turkey, some German sausage (which I can’t remember the name of), and salad. And it was a foot tall! Consisting of just 3 layers, there was 1lb of sausage, 1lb of turkey, and about 4 inches of lettuce leaves. It was such an awesome novelty to have a foot-high sandwich. But in the end the sheer amount of solid meat was just too much to handle. I couldn’t eat even half. Now, I can’t wait to go back to New York and visit Carnegie’s again one day, but next time I think I’ll choose something a bit more subtle and easy-on-the-palette. I’d take something with more individual layers, with each bringing a new and subtle flavour to the table. Something that took the chef a bit longer to build all the layers upon layers of tasty fillings. Fillings which individually aren’t much to write home about, but when you look at (and taste) the finished masterpiece, the flavours are compounded into a much more complex and tastier meal. Built in a way that makes it difficult to pick out everything that’s gone into it, if all you’re looking at is the finished result. When I first started using Photoshop to edit my photos, the novelty-factor was still pretty high and I’d find myself pushing just a handful of “big” adjustments. A few layers with some big saturation and contrast boosts had a great impact, but it was about as subtle as a sledge-hammer. Kinda like the big bertha 2lbs solid meat sarnie. But these days, instead of layering just a handful of big adjustments I prefer the subtlety of making a lot of small adjustments which build gradually towards the finished piece. Most of the images I create these days end up with at least 10 individual layers, each one adding some small benefit which I can brush in (using a mask) just where it’s needed. The moral of this story is that using many subtle layers which build upon each other is a better way to go than trying to do too much with too few layers – whether you’re processing a photo or building a sandwich! If you want to see exactly how I do this so that you can use the same methods and techniques on your own photos, then you’ll want to take a close look at my Luminosity Masking Mastery video course. It’s definitely worth checking out if you haven’t done so yet.